Faced with adversity since her childhood days, she could have easily surrendered to a limited life in a wheelchair. 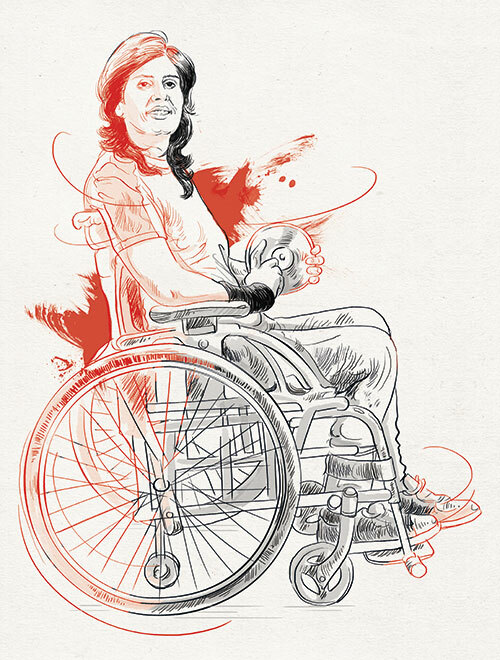 But for Deepa Malik, overcoming all odds to finally win accolades at last year’s Paralympics was the way to go. An avid fan of bikes, this shot-put expert revels in overcoming whatever challenges are thrown at her, and is aiming for the gold at the next edition of the Games. As a child, I definitely wanted to do some ‘crazy’ stuff, but didn’t know whether it would be in sports or elsewhere. I was keen to do something different, like racing or biking. When I was in the sixth standard, my father took me to Delhi to see the Asian Games. I won a medal at the same event in 2002. I was barely five-and-a-half when I first became disabled, but by eight-and-a-half I was walking again. The three-year journey was more educational than a setback. Most people faced with similar hurdles become introverted or depressed, but full marks to my parents for making sure I didn’t end up that way. I was always the centre of attention. When I was paralysed for the second time, my dad screened those who would be allowed to meet me and he made sure I was happy. At 30, when my husband was at war, my tumour reappeared and my father was the only one with me. I remember thanking the almighty for what was going right rather than brood over what was going wrong — I could still see my children every day and I would look forward to my husband’s calls. Winning the 2010 Para Asian Games bronze medal was a turning point for me. It turned me into an activist as it came at a time when our federation had gotten suspended. I stood up for all the Paralympians who were missing a voice. The greatest challenge of my life was training to be a Paralympian. It was a menopausal year for me, and I couldn’t take any tablets because we had to undergo frequent dope tests. I had to change my diet — it’s not easy at 46. I also carried a lot of guilt as a mother — I was busy building my career at a time when parents concentrate on their kids. I had time for nobody and had to socially cut myself off. I was not young, I was a homemaker and had to take care of everyone, but instead there I was, training for the Games. It felt selfish at times — I had to break away from a lot of stereotypes as well. Each one of us go through low phases, but it is important to identify one’s purpose to be happy. We have to know what brings us back, and fall back on it on a rainy day. For me, when I’m riding my customised bike, or eating golgappas, I’m at peace. When I invite friends over and have a chance to cook for them, I’m at peace. Sports has taught me to never give up; I have learnt that hard work pays; and that one must have a passion and a hobby. It becomes your source of happiness, and keeps you rejuvenated and self-motivated. In the world of sports, Mary Kom is a huge inspiration — she used to train when she had just had kids. I had also left my children back home when I was training. I would always think of her to overcome guilt. I met Olympian gymnast Nadia Comaneci for the first time when I got a sports award. It was surreal to meet someone I had only read about in school — I used to pretend to be her when I had just started walking again. I will continue to contribute towards the awareness of Para sports. My daughters have started a foundation called Wheeling Happiness, through which we are counselling the disabled and their caregivers, and educating people to develop hobbies. We’re working on accessibility campaigns, and I’m also the brand ambassador for Beti Bachao, Beti Padhao. I’m finding my own way to give back to the nation that’s given me so much. I hope my body remains healthy, as I want to celebrate my golden year with a gold medal at the Tokyo Paralympics in 2020!